In other news, Freddie Sjostrom is rumored to be aiding the Rangers financially by taking a pay cut from a reported $800,000, for a two year $650,000 deal. Nigel Dawes' deal, which I reported earlier at $600,000 was a bit high, as he took the deal he was offered at $587,500, signing on for one year with the Rangers. That leaves the Rangers with approximately $1.5 million in cap space. That almost ensures that neither Mats Sundin (or any other high profile player) nor Brendan Shanahan will be able to be signed, unless Shanahan takes a significant cut to remain a Blueshirt. Signing Shanahan would cause greater harm than good, as having him take up a wing spot on the 3rd or 4th line would just cut back the progress of our young prospects. Shanhan has done a lot for the Rangers and was a pleasure to have on the team, I just cannot see Tom Renney or Glen Sather giving up much needed cap space to sign a player who in the long run will deter the improvements of young players. Well as anyone on the site in the last couple of days has probably noticed a new voice in Darkville. Call him fiery. Call him in need of therapy. Call him whatever relevant Ranger name you want (please just NOT Malik) - as The Dark Ranger welcomes syr11!!! As I "tdr" is out of commission until the season begins, it has been fun seeing the numerous comments on the site...maybe the kid has people talking. Maybe we all need a little NYR optimism??? (Right Scotty and Pundit??). Who the hell knows anyway about this team!!? Last year we actually thought we were favored to win the East with the additions of Drury and Gomez and nothing happened. A year of newbies and defensemen just may be the trick. Ironically, this will be the first time we actually see Tom Renney coach the team. Funny, isn't it? Let's go Blue. The opening games in Prague against Tampa sounded like a great Ranger-favored idea, but after a hell-of-a free agency bionic transformation- these tampa folk look scary. Sonn enough, all will be revealed. Good luck syr11 and everyone show a little support! I think this kid has exactly what Ranger fans need..as Mr. TDR said, optimisim. This "kid" seems to have the necessary knowledge to talk Rangers hockey and the attitude that any sports team would love out of a devoted fan. So all you haters who have knocked him should just chill and angain as TDR said, show syrll some support!! Another “I am no hockey expert” post. Shanny was pivotal in the shootout last season. Without the extra point where would the Rangers have been at years end? Put him with Drury/Prucha on the second line or third line. Shanny for 1-2 million is great for the power play and overtime. bluenationleafs..youre an idiot, not syr11..shanahan is old, yes he was good for us in the shootout..but he is EASILY replaced by Zherdev..check out his breakaway goals on youtube. 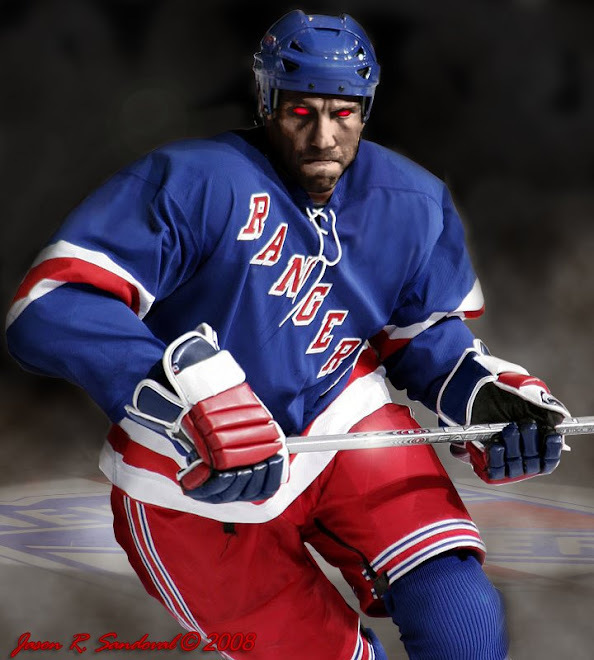 Shanahan is not what the rangers need, they need "to get faster and younger up front"--Glen Sather! Okay, I clearly understand both bluenationleafs point as well as syr11's point. Honestly, I believe the Rangers would be a better team with Shanahan. I think he would be a good veteran role player for the team and an asset in the shootout as well as on the powerplay. Plus he scored 23 goals last season, and we might need all the goal scoring help we can get if last year is any indication of what might play out in this one. Who can really be sure though. Maybe Drury will step up and be huge this year or maybe Prucha will regain that goal scoring touch we saw him have in his rookie season or, better yet, maybe Naslund, [Insert Ranger center here] and Zherdev will have great chemistry together, but as I said earlier: Who can really be sure? Either way, lets drop the puck! Go Rangers! Sorry but for the Rangers to go forward they need to say so long and good bye to Shanny. IF Drury and Gomez are to take over the leadership of the team then they can not have Shanny as their crutch holding them up. Drury and Gomez wanted the big bucks so now they must truly earn them as the Ranger leaders. I still am waiting for TDR to respond to the rumors that have him heading over to Russia as the blogger of the KHL. whats your guys take on the KHL and cherepanov coming to the NHL after this season? Any thoughts. What about you tdr? CAN WE ALL GET A LITTLE REAL FOR A MOMENT? BlueLeafsNation is a hack because this particular Leafs fan is...well,....exactly...a Leafs fan criticizing other teams. How typical. This coming from a team that just signed Jeff Finger (middle right atch ya) for 4 million a year (another defenseman), the second big signing was 2nd rate ex-Ranger enforcer Ryan Hollweg (traded for a fifth round pick....bad karma Sather from that move)----everyone visit Rangerland.com for the SATHER-HOLLWEG discussion, brilliance----bought out resident agitator Darcy Tucker---wants Raycroft to waive his no clause but he wants to stay, and asks their Captain Sundin last February for the good-of-the-team to please let us trade you. He refuses. He wants to be Leaf for life! But they don't court the guy, let him hit free agency this past July 1 -- and lost their Captain in the process. The Rangers have some re-building to do, but there is a veteran/youth mix that is extremely promising (and scary at the same time). BlueNation---you have a point, but we don't know anything until November --- give it some time before making such judgements. Analyze your own team -- you'd have a lot to say. Sjostrom plays the kind of game that the Rangers want to play. Whatever you do don't resign Shannahan. He's just going ti get injured and do nothing in the playoffs.Again! I Am A (Dark) Ranger! Revealed. So Long Jags! Where Did My Team Go?